When the Prophet salAllahu ‘alayhi wa sallam started his mission in Makkah and the members of the different clans of Quraysh began embracing Islam, the people of every house started cursing him and his Companions. They started practicing magic and charms on him to cause his death, even devising plots to kill him. At this, Allah subhanahu wa ta’ala commanded the Prophet salAllahu ‘alayhi wa sallam to recite these ayaat. Allah subhanahu wa ta’ala says, “Say, [O Muhammad], ‘Have you considered: whether Allah should cause my death and those with me or have mercy upon us, who can protect the disbelievers from a painful punishment?’” (67: 28). This ayah means what will it profit the unbelievers whether the believers perish or live by the grace of Allah subhanahu wa ta’ala. They should worry about themselves as to how they will save themselves from His punishment. For there is nothing that can rescue them from Allah subhanahu wa ta’ala except repentance, turning to Him for forgiveness and returning to His religion. “Say, ‘He is the Most Merciful; we have believed in Him, and upon Him we have relied. And you will [come to] know who it is that is in clear error,’” (67: 29). We believe in the Lord of all that exists the Most Glorious, the Most Merciful, while you (unbelievers) deny Him. Upon Him we rely in all of our affairs while you have put your trust in yourself, your own resources, and false deities besides Him. On the Day of Judgment you will come to know who has erroneous beliefs. 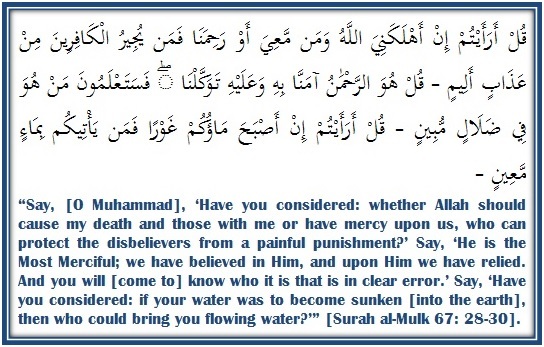 Allah subhanahu wa ta’ala continues, “Say, ‘Have you considered: if your water was to become sunken [into the earth], then who could bring you flowing water?’” (67:30). If the water was to go away and disappear into the lowest depths of the earth then it would not be reachable with iron axes or strong arms. No one besides Allah subhanahu wa ta’ala has the power to restore these springs of water for us. So, it is merely out of Allah’s favor and His grace that He causes water to spring forth for us, and He makes it run to the various regions of the earth in an amount that is suitable for the needs of servants, be it little or abundant. All praise and thanks is for Allah subhanahu wa ta’ala.